The Illuminize peel utilizes a new generation of alpha hydroxy acids with phytic acid and commonly used peeling agents to maximize skin rejuvenating effects with low irritation. Achieves enhancement of skin appearance with minimal downtime and discomfort. The Illuminize peel is gentle enough to use every 2 weeks until desired results are achieved. 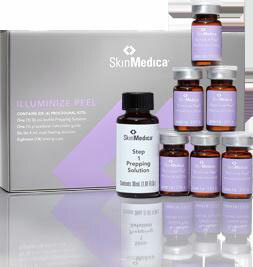 Generally results are cumulative and maximum benefits are seen with a series of 3 or more peels. 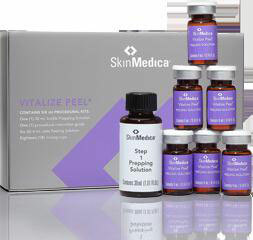 The Vitalize Peel helps fight the effects of time, sun damage and environmental assaults with the benefits of alpha hydroxy acids, beta hydroxy acids, resorcinol and prescription retinoic acid to provide a safe gentle treatment that has been clinically proven to help reduce the visible signs of aging. The Vitalize peel can be used every three weeks. While you will see noticeable results after just one peel, you will find significant results with a series of 3-6 peels. Our aestheticians will analyze your skin and create a customized facial using pharmaceutical grade product to address your individual skin concerns. When your facial is complete we will help you create your long term skin treatment plan combined with take home products to keep your skin looking its best every day. Microdermabrasion is a technique for removing the topmost layer of skin leaving it supple and vibrant. The DiamondTome wand removes this layer of skin with natural diamond chips, while at the same time vacuuming the dead skin cells away in a sterile and controlled manner. Removing this outer layer of dead skin cells leaves a smoother texture and promotes the growth of healthy new skin cells. Unlike other exfoliation treatments, the DiamondTome system uses no loose abrasives to contaminate you or the environment. Your skin will look and feel smoother after just 1 treatment but is recommended in a series of 4-6 for best results.